Rachel Roddy's Five Quarters won the Guild of Food Writers' First Book award and the Andre Simon Food Book award 2015. Instead, captivated by the exhilarating life of Testaccio, the wedge-shaped quarter of Rome that centres round the old slaughterhouse and the bustling food market, Rachel decided to rent a flat and live there. Thus began an Italian adventure that's turned into a brand new life. Five Quarters charts a year in Rachel's small kitchen, shopping, cooking, eating and writing, capturing a uniquely domestic picture of life in this vibrant, charismatic city. Combining Rachel's love of Italian food and cooking with a strong nostalgia for home and memories of growing up in England, this is a cookbook to read in bed as well as to use in the kitchen. Five Quarters stands out as particularly considered and evocative...Impeccably researched and transportive, it's a proper read, rather than a quick flick. -- AA Gill * Sunday Times, picked as best cookbook 2015 * Unpretentious, unusual and delicious. * Country Life * The writing beautifully describes a quiet domestic life centred around her kitchen, while the photography by Roddy herself is reminiscent of Dutch interiors. 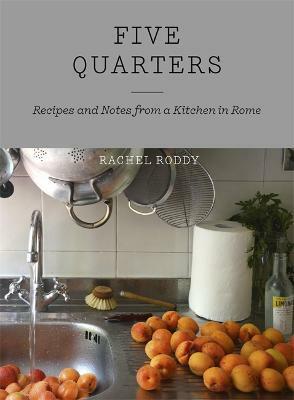 * Ham & High * Rachel Roddy's Five Quarters is by an English food blogger settled in Rome, who felt a natural affinity with the simplicity and resourcefulness of Roman cooking; this is a homage to the quarter in which she lives and the food of her neighbours. * Evening Standard * This wonderful book, which came about as a result of an award-winning blog, charts a year of cooking in the tiny kitchen in her flat, shopping at local markets and writing about her culinary finds... an unputdownable book packed with the unpretentious home cooking, heady with the smells of Southern Italian markets. * Crumb Magazine * Just looking at the juicy apricots on the cover of this recipe and memory-filled love letter to Rome is enough to transport you to Italia - land of delicious, superior, mouth-watering cuisine... Five Quarters illuminates the colourful experience of a year in her Italian kitchen where she cooked, ate and wrote, with her notes contributing to the book's 120 both Italian and British-influenced recipes. * Scottish Woman Magazine * This is the most wonderful cookbook, especially - though not exclusively - if you like really reading cookbooks, possibly in bed. Rachel Roddy is a marvellous writer, and her ruminations about living in Rome - about markets, pasta-cooking water, being unfaithful to her usual butcher, Jane Grigson, the old Jewish ghetto, letting the meatballs rest, her daily life and so on, are total heaven (also, excellent restaurant recommendations). What I especially like is that she sounds like a real, complicated-in-a-good-way, intelligent and forthright person, not some ninny going 'Ooh, I love Italy, me' while poncing about on a Vespa. She is proper. You feel like a friend is leading you by the hand, going 'Look at this, make this, and if you make it like this it will taste even better'. Rachel Roddy writes a weekly award-winning column in Guardian Cook. Rachel's first book Five Quarters won the Andre Simon Food Book award in 2015, as well as the Guild of Food Writers' First Book award. Rachel has lived in Testaccio, a distinctive working-class quarter of Rome, for over twelve years. She shares a small flat near the food market with her partner Vincenzo and son Luca and spends part of the year in Vincenzo's family house in Gela, south-east Sicily.